Many people believe that they can brace their weight with their hands in a minor collision. This is not true. 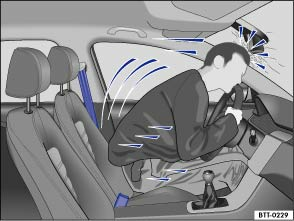 Even at low speeds, the forces acting on the body in a collision are so great that occupants cannot brace themselves with their arms and hands. 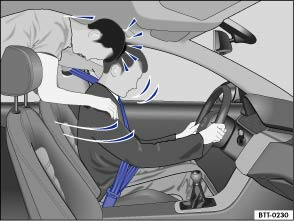 In a frontal collision, unbelted vehicle occupants are thrown forwards and will make unchecked contact with parts of the vehicle interior, e.g. the steering wheel, dash panel, or windscreen . The airbag system is not a substitute for the seat belts. When triggered, the airbags only provide additional protection. Airbags are not triggered in all kinds of accidents. Even if the vehicle is equipped with an airbag system, all vehicle occupants, including the driver, must fasten their seat belt and wear it correctly while the vehicle is in motion. This reduces the risk of severe or fatal injuries in the event of an accident – regardless of whether an airbag is fitted for the seat. An airbag can only be triggered once. To achieve best possible protection, seat belts must always be worn properly. This also ensures that protection is provided in accidents in which the airbag is not triggered. Any vehicle occupants not wearing a seat belt can be thrown out of the vehicle and sustain more severe or even fatal injuries as a result. It is also important for the rear seat occupants to wear seat belts properly, as they could otherwise be thrown forwards violently in an accident. Rear passengers who are not wearing seat belts endanger not only themselves and the driver, but also other people in the vehicle .